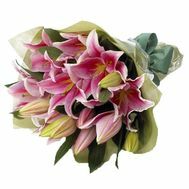 A bouquet of lilies is ideal for creative and romantic natures. This flower is actively used by florists to create compositions and bouquets of different shapes and sizes. 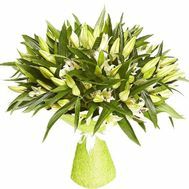 The most luxurious and exquisite look bouquets, based on oriental flowers. 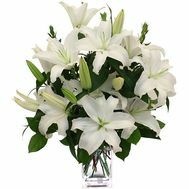 Lilies can be bought in any floral salon, with full confidence can be called a serious competitor to roses. This flower has a certain severity, which is not found in any other flower. 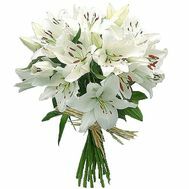 Compositions based on this beautiful gift of nature symbolize purity, chastity and tenderness. But if you chose a bouquet of these flowers, remember their specific flavor. He is able to create a dizzying atmosphere and a certain charm. Many perfumers have spent a decade trying to recreate such a fragrance, but it's not so simple. Fine you can buy lilies in Ukraine for more than acceptable prices. These flowers perfectly match with bright red roses. 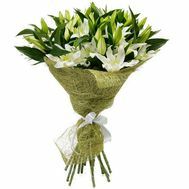 A bouquet made on their basis is distinguished by its elegance and originality. It is the perfect fit for especially solemn moments. When combining these unique colors with orchids, gerberas and chrysanthemums, compositions are produced that embody majesty and strength. 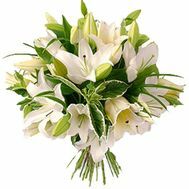 Beautiful bouquets of lilies used to use as a wedding composition, complementing the image of a beautiful bride. 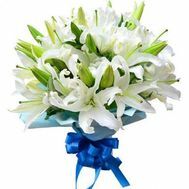 Such a wedding bouquet, made by real professionals, is able to intrigue and fascinate. The petals of this flower are similar in their tenderness to the bridal veil of the bride. 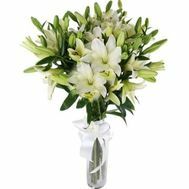 Particularly relevant cascading bouquets, ideally suited to chic dresses with a train. 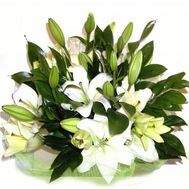 Chic bouquets and compositions from lilies can not leave anyone indifferent. 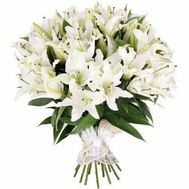 If you are going to hit your favorite girl, give her a bouquet "Geneva" (lilies are combined with a pink orchid and decorative elements), "Desert" (a unique combination of white alstromeries and carnations), "White Waltz" (lilies and white roses decorated with decor elements ). 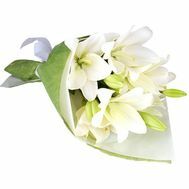 The flower gift you have chosen will be delivered to your home and office. 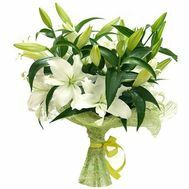 Exclusive compositions of lilies in the city of Kiev can be ordered without leaving your own home. 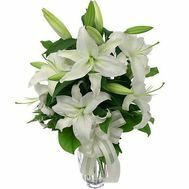 The 24-hour service offered by most of the florists' salons will realize any of your flower dreams. And all this is quite inexpensive. Give your loved ones a little joy and unsurpassed memories!